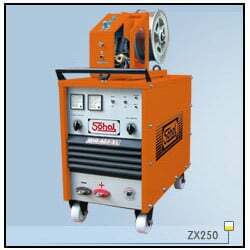 The ZX series of Mig welding are excellent machines. These produces uniform weld bead and low spatter due to its double star transformer with reactor and DCL. These have 16 voltage steps for output power setting by two switches, one for quick setting and another for fine setting. The combination of two switches are more durable rather than a single switch. The output brass terminals have been replaced with copper strip insulators. The wire feeder unit contains solid state motor drive brake and plug-in control circuit. 100 tested for non-stop work.